The Insider's Guide to UC | Tūpono - Page 617 of 649 - Where Canterbury students share their experiences. Colour My Toga– The iconic toga party is a must do for first years. Once you’ve worn a sheet in the middle of Ilam Fields you’ll feel like you’re right in the midst of your uni experience! This year the theme is to wear a toga in the colour of your university department. So head to your nearest Fabric Vision or ask your granny for some old sheets and you’ll be good to go! Remember extra safety pins are vital… you’ll thank me later. Under the Big Top– If you want to watch some side splitting comedy then this event is for you! The UCSA comedy shows I’ve been to have always been a great laugh, mainly due to the hilarious comedian and audience interaction (as you can always rely on uni students to put their foot in their mouth). This year the show will be hosted by Paul Ego from 7 Days, which sets you up for a night of hilarity! 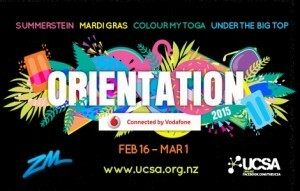 Mardi Gras– I’m just going to go out on a limb and say that I think this might possibly be the greatest Orientation event that the UCSA has ever created. This year will be its second appearance on the line-up and I can’t wait. Last year there were lights, beads, costumes, great music and even fire. It has to be seen to be believed. Ooh so mysterious…learn a new party trick before you go so that you can impress people for beads! Clubs Day– This is a standard orientation event which you won’t want miss. At clubs day you can sign up to a variety of different university clubs including: social clubs, sporting clubs, art clubs and volunteer clubs. Through the clubs at university you can explore your interests, learn new skills, meet people and have a more fulfilling university experience overall. Summerstein– This is the last major event of UCSA’s Orientation. It’s a chance to unwind and spend a day relaxing in the sun with your friends. Last year some of The Edge DJ’s, including Guy Williams, even turned up to enjoy the day. This year the UCSA has promised water cannons and a giant slip n slide, so I honestly can’t wait! Also look out for beach volleyball, backyard cricket and cocktails. Hannah Rhodes is the kind of person that finds joy in helping others. It seems to come naturally to her. I first met Hannah in 2014. She was in the POLS Honours students’ room, which was next door to my COMS Honours students’ room in Locke. One day, I was in the common room fretting about an upcoming assignment. I had to come up with 3 different innovative media projects to pitch to the class. As I sat there racking my brain for ideas, Hannah started suggesting some off the cuff ideas for me while casually preparing her lunch. In my frazzled state, I so appreciated her input. Her ideas got the ball rolling for me, so to speak, and soon enough I had more than enough ideas for the assignment. That’s Hannah – a good sort – willing to help anyone out. 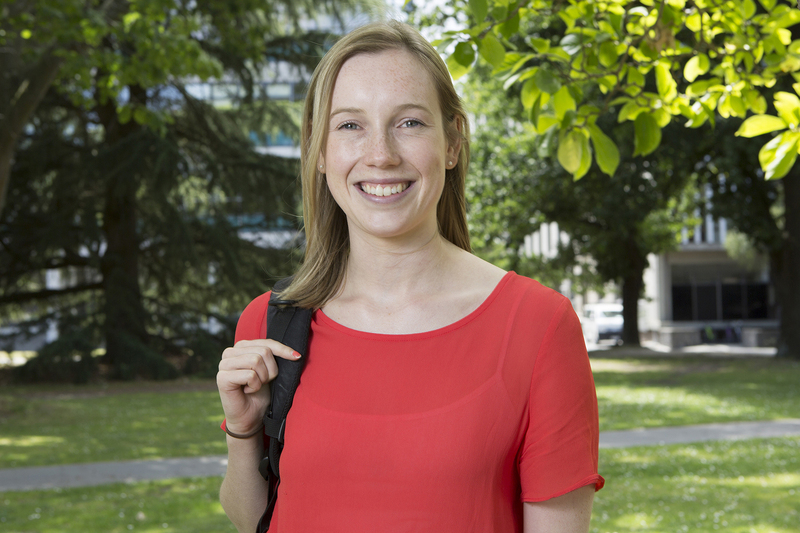 So naturally, after completing her Honours year in Political Science she continued her passion for helping others, but with much more worthy recipients than just a distressed student. 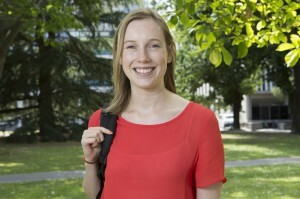 Hannah got involved with Linda Cruse – UC senior fellow, entrepreneur and humanitarian aid worker – whom she had approached after hearing her speak at university about her international aid. With the help of the UC Innovators programme, which awarded Hannah a summer scholarship, as well as some self-funding, she was able to travel to the Philippines with Linda to help small communities rebuild their lives post-typhoon in the forgotten area of Carles. For two weeks, Hannah stayed in the community hall, sleeping on the floor. The conditions were very hot and humid. She says she “definitely got used to working in sweat. We probably got up at about six in the morning and then went to bed at about eight or nine at night” – working out in the heat of the day for most of that time. The facilities were very basic – a squat toilet with a bucket for flushing – and another bucket for showering. During her stay Hannah taught basic hygiene to school children and helped set up small businesses such as community gardens and a chicken project. These sustainable projects are life-changing as the families are able to sell the produce and eggs, providing a daily income for basic goods and children’s school fees. The way they talked about their new projects was a highlight for Hannah. “They’re so excited and they feel like they’re growing and independent. They have ownership of it and they’re proud of it”. Also, here’s Hannah talking about her time in the Philippines and the focus of ‘Be the Change’ in 2015 (YouTube). My first year of uni is all done and dusted and it went by quick; so quick that it was over before I knew it. Looking back, all I see is a good year and a decision well made. From moving to UC purely due to economic reasons simply because it offered the highest scholarship, to actually enjoying my time here, I’ve come a long way. Academic study, work and the social aspect have all been worth the price and the distance from home. I’ve met all kinds of people which has helped me expand my cultural knowledge. I consider myself fortunate to have met so many people and made good friends in such a short period of time; friends who care, who have goals and ambitions, and friends who are trustworthy. The academic standard of UC is also one of the criteria that drew me here and I am not disappointed! With exceptional teaching standards and an even more impressive student-oriented development approach, UC has checked all my boxes in terms of academic infrastructure and teaching facilities that the usual international student looks for. Coming from India, a ridiculously crowded and busy country, perhaps the only negative of my decision would be the population and atmosphere of the city. I miss the crowds, traffic and the general urgency that people have in getting things done. However, UC’s thriving student life completely makes up for it by providing a really vibrant campus. The events hosted by both UC and the UCSA are commendable, especially those that are held to help ease the transition for first years, be it academic or social. In a way, the lack of buzz in the city is probably why UC has such a strong, active student body that keeps and contains all student life on a thriving campus. To a university that has given me so much I’ve always wanted to give back as much as I can and fortunately, I have had the chance to do so this year. Working for various departments at UC throughout the year I have had the chance to provide my services to this institution and learn how things work from an administrative point of view; and I can gladly say that a large part of everything done is aimed with the best interest of students and the wider community in mind. Halfway through the year, I realised that I wanted to play an active part in delivering the student life that UC has to offer and have taken some measures accordingly. One of them, is being fortunate enough to be able to blog on this website which has been my only outlet to communicate to the student base at UC. UC has a solid mentoring program and before next year, I should be officially on board as a mentor and be able to help anyone throughout the year as needed. Doing one thing at UC always opens up more opportunities and mentoring gives me the chance to be a student leader at both UC Orientation Day and International Welcome for 2015. This, I am particularly excited about as I get to meet and welcome new students and can relate to them entirely as it hasn’t been too long since I was in their shoes. If I have to give some pointers to freshers, it would be to put yourself out there completely and shamelessly; the more you do, the more you know. This particularly helps internationals, as you have so much on your plate that you barely have time to get homesick. Also, living on campus, at least for the first semester, is highly recommended. It may be more expensive but is totally worth it. You constantly meet new people which helps ease the transition because you’ll soon have plenty of faces and names that are familiar. The last thing I can recommend is to know when to ask for help. Sure, most of the time all of us know what to do and how to, but sometimes you have to step aside and admit that you don’t know something and need help; don’t let your ego or fear get in the way. It is okay to ask for help at any point and personally, I think it’s brave to realise that you need a hand and actively seek it. At the end of this year, all I can say is I can’t wait for the next year and look forward to what it has in store for me as I know it only gets better from here. I am blessed to have had the opportunities I’ve had and am fortunate to have been able to set up a great support system, both at university and otherwise, and am truly grateful for all that has happened and everything that will.